Over the last three decades, he’s been unearthing and reconstructing dinosaurs for museums around the world. In 2011, he became an overnight celebrity in the rarified world of paleontology when he discovered the first feathered dinosaur ever found in the western hemisphere. Dinosaur Valley Studios is an incredible base of operations located in some of the most beautiful landscape you’ve ever seen. DVS provides experienced skeletal reconstruction, prop design, manufacturing & molding, as well as exceptional services in set design & construction. They also have a plethora of movie shoot locations with a short distance, fully-equipped studio facilities and prop workshops, as well as a host of other amenities to service the film and television industries during productions. We were given tons of initial creative inspiration and exceptional hospitality on our tour with legendary paleontologist Frank Hadfield and office manager/prop-maker Samantha Campbell, and we brought that inspiration home. 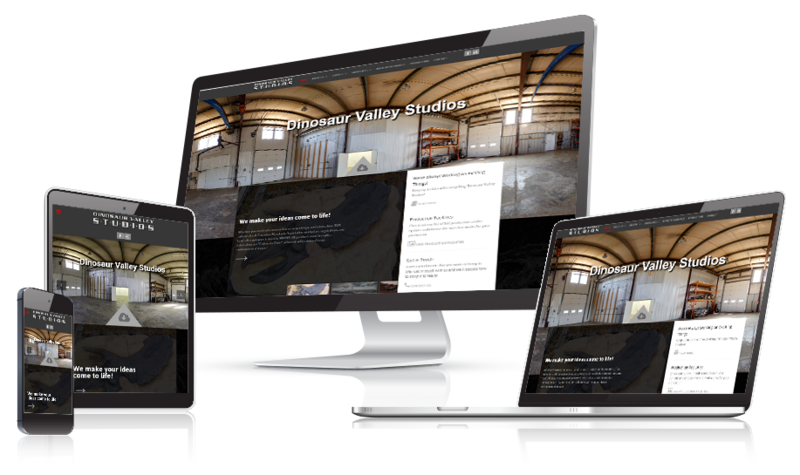 Blended paleontology imagery, sharp contrasting colours and beautiful professional photography wielded by our expert web designers to produce a web presence entirely indicative of the very cool and creative nature that is Dinosaur Valley Studios.